Ready4K is a text message curriculum for parents and caregivers of children (birth – 3rd grade) to give them the information they need to help build children’s language and literacy skills by the time they start kindergarten. It’s available in English and Spanish. Ready4K breaks down the complexity of parenting into small steps that are easy to achieve. In addition, the program provides continuous encouragement and support to parents over an entire calendar year. 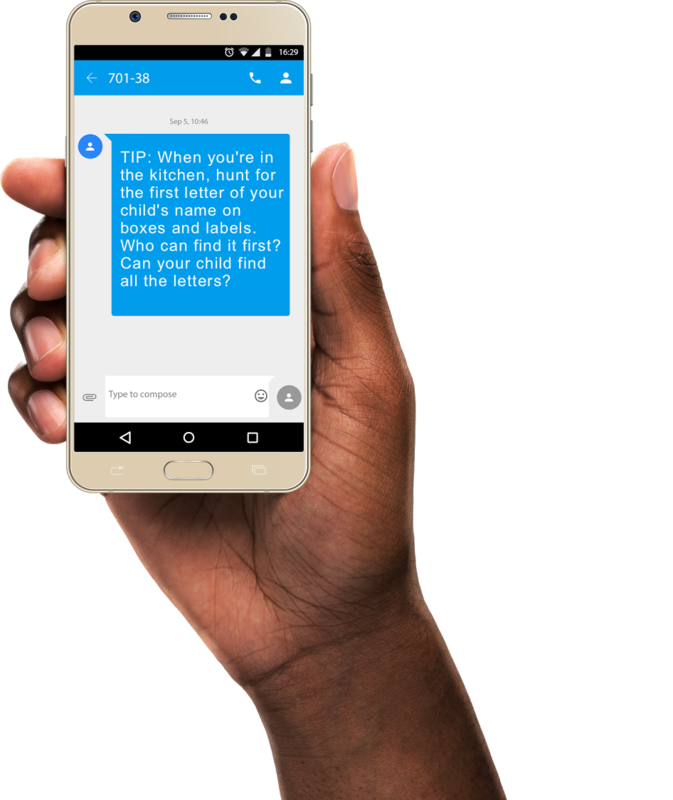 Each week, Ready4K sends three text messages to parents and caregivers to help them build their children’s skills by maximizing existing family routines in fun and easy ways. FACT: The grocery store is great for building literacy skills. On the way to the store, ask your child to name all the fruits & vegetable s/he can think of. TIP: When you’re at the store, go on a letter hunt. Can your child find an “A” on a sign, box, or food label? What about a “B”? Can s/he go all the way to “Z”? GROWTH: Keep using time at the grocery store to build literacy skills! Ask: What rhymes with egg (leg, peg), cheese (knees, please) & jelly (belly, deli)? In a series of randomized controlled trial studies, Stanford University researchers found that the Ready4K approach increased family involvement at home and school, ultimately leading to two to three additional months of learning gains in literacy for preschool aged children. In a follow-up study, these effects persisted after parents received another year of texts. The results of this research have been highlighted in The New York Times, The Huffington Post, and Education Week.